Outdoor playhouses can be built in all shapes and sizes and from the smallest to largest of budgets. These playhouses are on the extravagant end and really might be more impressive to the parents than the kids but for families with the cash and space, these playhouses will make you the most popular parents on the block. The budget on these playhouses can go up to $200k and many of the options mirror those found in full size homes such as upgraded kitchens, floors and lighting. 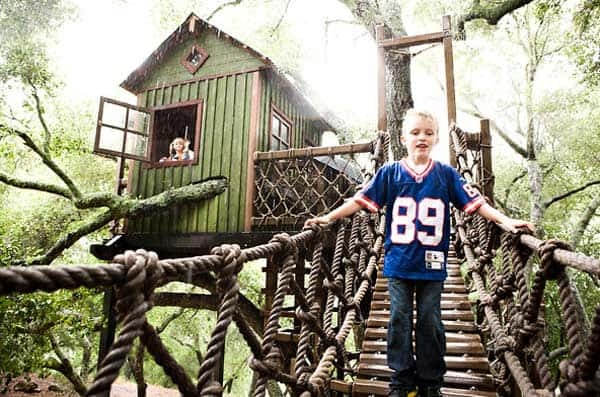 Check out this gallery of extravagant playhouses. Keep reading for details on who makes these playhouses. These companies are at the forefront of playhouse construction and many of them will build custom playhouses. ArchitectureKids, a company based in Tempe, Ariz., sells fanciful Disney-esque playhouses shaped like windmills, pirate ships and castles for $50,000 to $150,000; (480) 967-3409 or architecturekids.com. Lilliput Play Homes, in Finleyville, Pa., specializes in cottage-, Colonial- and Victorian-style houses, for $4,000 to $50,000; (724) 348-7071 or lilliputplayhomes.com. Kids Crooked House, a company in Portland, Me., makes off-kilter playhouses that a young Salvador Dali might have liked, for $1,500 to $8,000; (888) 447-5446 orkidscrookedhouse.com. PoshTots, an online retailer, carries high-end playhouses from a variety of manufacturers, from $6,000 to $122,000; (866) 767-4868 or poshtots.com. SmartPlayhouse, a Spanish company, sells modernist playhouses, for $3,100 to $13,000; 34-935-805-000 or smartplayhouse.com/en. Modern Cabana, based in San Francisco, specializes in modern, environmentally friendly playhouses. The Kiddo Cabana ($2,200), for example, has a green roof where children can grow grass, succulents or plant a vegetable patch; (415) 206-9330 ormoderncabana.com. La Petite Maison, in Denver, creates playhouses in any style parents and children can dream up, for $9,000 to $75,000; (877) 404-1184 or lapetitemaison.com. Barbara Butler Artist + Builder Inc., in San Francisco, custom-makes sustainable redwood structures with ladders, bridges, chutes and fire poles to encourage active play; prices range from $4,000 to $200,000; (415) 864-6840 or barbarabutler.com. To see more on extravagant playhouses check out this article from the New York Times.